Join us for a stylish Christmas or spring break on the Amalfi Coast in the famous resort of Sorrento. Boasting some of the best views across the Bay of Naples over the blue Tyrrhenian Sea, this historic seaside town surrounded by hills, lemon and olive groves and majestic cliffs is perfect for exploring the archaeological site of Pompeii and Herculaneum and the gorgeous island of Capri. Positano, with its cobbled main street and interesting array of shops, is an absolute joy to explore, as is the UNESCO World Heritage listed Amalfi, with its historic cathedral and narrow alleyways. We include a scenic guided tour along the Amalfi coastline, with a visit to the historical centre itself, to marvel at the scenery and learn more about this much-loved area. Optional excursions include a visit to the fascinating excavations of ancient Pompeii or Herculaneum, destroyed by the eruption of Mount Vesuvius. Additionally, a relaxing boat trip to the sophisticated Isle of Capri is also an option, during your leisure time, for a spot of shopping or perhaps even celebrity spotting! A guided walking tour of Sorrento will unearth secrets of the past as well as modern delights; ‘old’ and ‘new’ Sorrento blossom into life as we explore together with our local guide. Glorious views stretch out on a clear day as far as Mount Vesuvius, the city of Naples and the quaint Isle of Ischia. 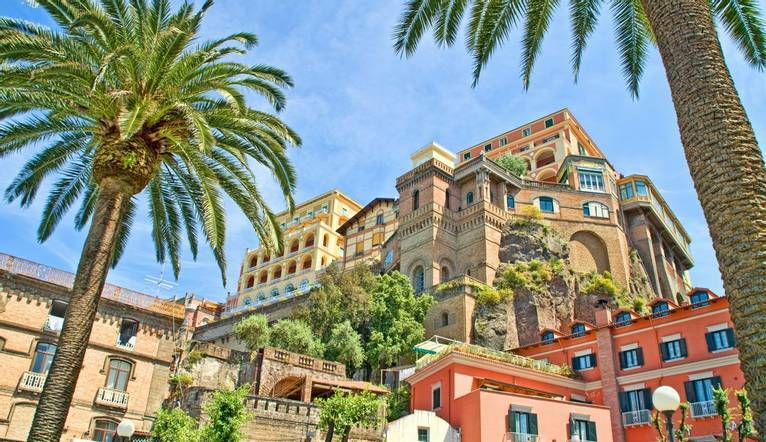 The pretty Old Town hides many a fine restaurant and delightful street café, while its small harbour offers the possibility of ferry departures to Naples, for those wishing to explore a little further. While here, why not sample some delicious Limoncello, a tasty lemon liqueur made from the splendid big lemons the region is known for, or browse for colourful ceramics? The best Solos holiday I've been on so far; so well organised. Our Tour Leader was brilliant, friendly and helpful without being overbearing. Oh, and the weather couldn't have been better so that helped as well. :-) I'll definitely go back one day. Thank you. Set high on the cliff-side overlooking a beautiful part of the Bay of Naples, our hotel is the perfect place from which to explore the area. Elegantly decorated in a classic, refined style, the hotel is steeped in history, with the oldest wing dating back to the 16th century. A few minutes’ walk from Sorrento centre, our hotel facilities include a stylish restaurant and a delightful terrace bar which provides fabulous views of the Sorrento sunset. A former manor house, this hotel's guest rooms vary in size and style, yet all have a telephone, satellite TV, safe and hairdryer. A full day tour to the exclusive Isle of Capri, including Anacapri, Capri Centre, Augustus Gardens and Marina Grande. There will also be time for shopping and an optional visit to the Villa St. Michele. A half day tour, visiting the fascinating excavations of this early Greek and Roman city, destroyed by an eruption of Vesuvius in 79 AD. A full day tour, visiting the less famous, but no less fascinating Herculaneum followed by a walk up Mt. Vesuvius (weather permitting). At Christmas time, various traditional village cribs are displayed and numerous church services take place, while we include a festive Christmas Day lunch together to celebrate. Over Easter, Holy Week in Sorrento features some of the largest processions in the world on Good Friday, with a procession of white robed followers at 03:00 and a procession of black robed followers at 20:00. In anticipation, local churches are ornately decorated – you may decide to witness one of these special events. In addition, we include a special Easter lunch. Listed below are just some of the tours, which may be available to you. Full details of all the excursions available will be advised at the Information Meeting. Prices may vary, depending on numbers etc and are only a guideline. Optional tours may be paid for in local currency in cash only. Your Tour Leader will be happy to arrange these for you but may not necessarily accompany you. Drivers and guides expect to be tipped after a tour. Please be prepared to contribute €3 at the end of each optional tour you do. Please also note that prices are dependent on minimum numbers and may cost more if the minimum is not reached. A half day tour, visiting the fascinating excavations of this early Greek and Roman city, destroyed by an eruption of Vesuvius in 79 AD. Cost: Approx. €38, plus €13 for entrance. A full day tour, visiting the less famous, but no less fascinating Herculaneum followed by a walk up Mt. Vesuvius (weather permitting). Cost: Approx. €50 plus €13 for entrance. Your Tour Leader will be on hand to offer advice or suggestions if required but gratuities are offered entirely at the sole discretion of the individual. We suggest a group collection to cover drivers, porters and hotel staff of €20.00. Your Tour Leader will collect this on your behalf and distribute it accordingly, thus relieving you of the burden of who, when and how much to tip. The tipping of housekeeping will be left to your individual discretion (a small amount left in your room on departure should cover this and would be much appreciated). As is customary, ‘the hat’ will be passed around for the driver and guide on all optional excursions. For any meals that are not included in your itinerary, or taxi fares, your Tour Leader can advise of an appropriate Ͽo add on. Comfortable wear with layers during the day. Smart casual wear is recommended for the evenings. Sweaters, coats, warm jackets would be necessary with rainwear in case of showers. Comfortable shoes are a “must” for sightseeing. Please note that a Tourist tax of €1.50 per night is payable locally at the end of your stay.